Shulman, Polly (2010). The Grimm Legacy. New York: G.P. Putnam’s Sons. 336 pages. Have you ever wondered what became of Cinderella’s slippers or Sleeping Beauty’s spinning wheel? What about the Mirror on the Wall? No? I suppose most of people don’t spend their free time contemplating the locations of magical fairy items. Elizabeth has not considered these mysterious objects either; she is much too concerned with her new school, making new friends and dealing with her step-family. Yet when she writes a history paper about the Brothers Grimm, Elizabeth’s social studies teacher not only gives her an “A” but recommends her for a position at the New York Circulating Material Repository. Part library, part museum, part secret society, the Repository is nine floors of antiques, textiles, tools…and the magical objects of the Grimm Collection. Just as Elizabeth is becoming more comfortable with the strangeness of her new job—the Repository is in possession of Marie Antoinette’s wigs, Shakespearean doublets, and ancient Egyptian papyrus shoes—stories of missing items and a previous library page reach the curious ears of our narrator. 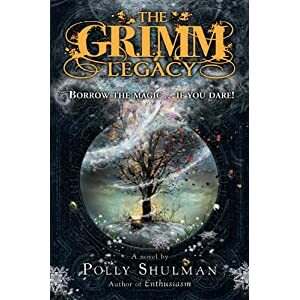 The description of the Grimm Collection, the library and the libraries history are original and fun. From the absurdities of the materials in the Repository to the inclusion of call numbers for Cauldrons (I*GC 133.44 HC, I*GC 133.44 M33, and I*GC 133. 44 T47) the detail of this world touches upon the detailed world building in J.K. Rowling’s Harry Potter series. So charming—in many ways—I have little criticism for such an engaging story. The main weakness of the book centers around the discovery of the villain responsible for the thefts and kidnappings who does not have enough face time to really impact his discovery and downfall. The story’s centerpieces are the Repository and the character relationships; the plot is not secondary, but the villain’s actions, motivations and clues leading up to his demise could be expanded for further depth. However with a climax that involves a large porcelain doll collection, a huge bird, a griffin, unlikely love, a villain and a homeless woman, the ending of this young novel does not disappoint (and you should be wondering about that doll collection). Sarah Beth Durst’s “Into the Wild”, Michael Buckley’s “The Sisters Grimm” and “Beauty” by Robin McKinley are other fairy tale adaptations that may intrigue you after you finish reading this enchanting novel. “A carpenter has three sons. The eldest builds a palace from alabaster and porphyry. The second builds a courthouse from granite and sandstone. The youngest builds a cottage from walnut shell and a corn husk. How man nails do the three sons use? Then I would ask young readers if they think they would be eligible to work in the Repository. Should be fun. Here is the non-interactive link to my library. I also have it as a Google Doc so that you can see the comments, and resort by category. But this gives you an idea of the sheer volume and complete ridiculousness of my obsession, yes? Well, now, blog-o-sphere. I have not forgotten about you. I have just bee pre-occupied with finals and pre-Christmasness. Fear not, however. 2010 will yield a better experience for you from my reknowned blog! I am gearing up for the ALA Midwinter Conference, which should be fantastic. I got my official nametag and pass; hello professionalism! Also, I am anticipating a good time at the Open Heart talk with Kristin Cashore, Gregory MacGuire and Jo Knowles. I truly love my new world of literature and libraries. Plus the Boston bars ARE pretty great. So, it is Christmas. I find myself alone for the first time in 8 years. Currently I am blogging, listening to music, pretending to read and cuddling with a puppy next to a space heater. Not exactly a fireplace, but it does the job nonetheless. I just finished reading Josh Lieb’s “I am a Genius of UNSPEAKABLE Evil, and I want to be your CLASS PRESIDENT”. Overall it is a highly entertaining read. The snarkiness, the arrogance, the intelligent jokes mixed with middle school humor is delightful and charming. However, and possibly as a result of my recent foray into the world of criticism, I found the premise lacking. Because it is a story based in reality, I wanted explanations for the goings-on of Oliver. Is he really just a loser who has created this far-fetched reality to cope with the miserableness of his existence? Which is what I was tending to think as I was unable to suspend my disbelief and relinquish this idea. However, it will make you laugh and amuse you to no end. So, real evil or pathetic fop, it is worth the read.